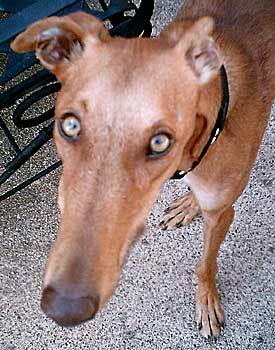 Edu is an an almost 3-year-old red fawn galgo with gold eyes, born January 10, 2003. Edu and Rayas are siblings and were found together as strays on the streets of Madrid. 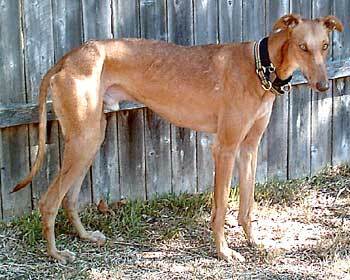 Both boys were fostered by a couple in Barcelona and lived with many other greyhuonds. 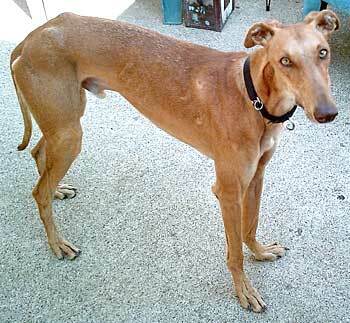 Edu, like Rayas, is shy with people but gets along well with other dogs. He is getting used to the television, ceiling fans and other household sounds. Edu is currently in the process of completing his medical procedures and being evaluated to see if he is cat and small animal tolerant. I really wasnt sure what was happening  I was going somewhere, but no idea where. I had been in this crate for hours and of course, I couldn't hold it for the entire trip. I was scared and cold and there were lots of loud noises all around me. I knew that I was at the end of my trip (in a place called Dallas) when the door to the crate opened and there were all of these people wanting me to come out. As tired as I was of being in the crate, I wasn't sure I wanted to leave it. I had no idea who all of these people where, but they were very nice. They wiped me down and took me outside to do my business. Unfortunately for them, I decided that inside baggage claim was the best place to do my business. I felt much better after that. But my trip wasn't quite over. I had a short car ride where I took a nap  it was dark outside and I hadn't slept a wink on the plane. When the car ride was over, I was allowed to run around in a fenced in yard. There were two people there talking to me but I couldnt understand a word they said  they weren't speaking Spanish! After a little while, I was given a bath and then a good towel drying  I smelled much better after that long trip. My next surprise was meeting the two canine residents of the household  they were very polite and we just might get along. They are older than me but if I am careful, they might let me stay. I must teach them Spanish quickly as we can't keep saying "hola" forever. I was starving and finally got a little bit of food and water. I was getting sleepy but was still not quite sure where I should sleep  and still a little scared. One of the people kept guiding me over to one of the big pillows on the floor and finally, I laid down, exhausted. I didn't sleep well that night but the next day when all was quiet and the two people were gone, I snored with the best of them! I think I might like this place called Dallas.